So I thought about waiting to share this on the 4th, but it's just too much fun and I couldn't wait. I'm definitely proud to be an American (specifically, "Horses, etc.") and you should be too! 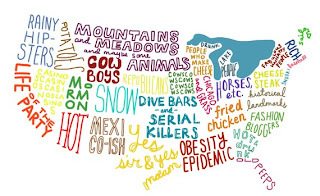 This print is titled "Stereotypes of America" and just for the record, was created by an Californian. You can find this print HERE for $18 at the HaleyforEtsy Shoppe on Etsy. You can get me one too while your at it! Spoil Yourself and Support the March of Dimes! Wordless Wednesday- There's a baby in there!